She never expected to be famous. Meredith Haga just wanted to live. Meredith’s message went viral, reaching more than 1 million people in May 2016. I am here because of an organ donor. An honor student and stand-out athlete in high school, Meredith suddenly fell ill the summer between her junior and senior year. An auto-immune disease that attacks the kidneys had taken hold and Meredith quickly found herself in chemotherapy. 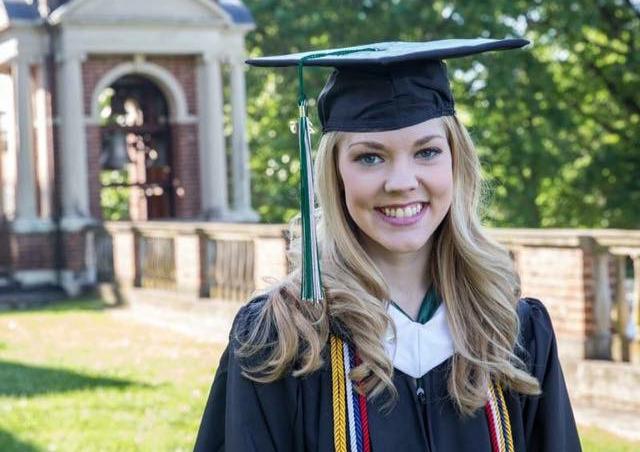 The treatment worked for a while, but by the time she was to begin college at Sweet Briar in 2011, her kidneys failed. On dialysis, she waited as her bright future hung in the balance. She would need a new kidney to survive. Good news finally came. Eleven months later, her stepfather was found to be a match as a living donor and gave his kidney to Meredith that September. By January 2013, Meredith was re-enrolled at Sweet Briar. She graduated with a degree in biology just 3 1/2 years later, in May 2016. We caught up with Meredith to find out where she landed after graduation and what’s in store for her in 2017. Lifeline: More than 1 million people – and counting- have seen this photo of you at your graduation from Sweet Briar College. Why do you think this photo resonated with so many? 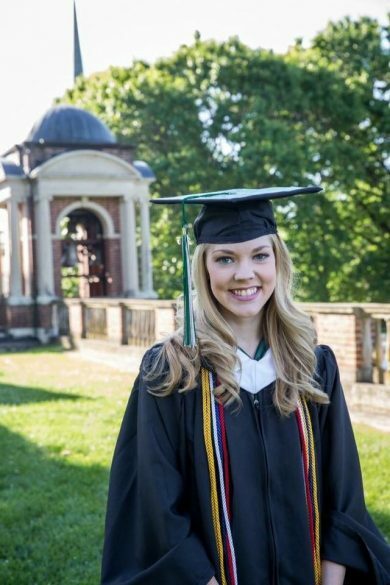 Meredith graduated from Sweet Briar College in 2016. 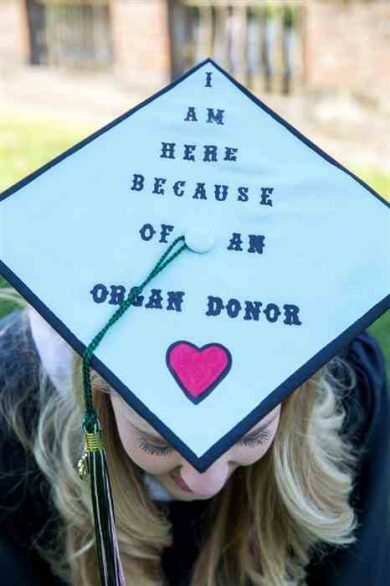 Meredith: My intention behind the cap was not for it to go viral, but simply a gesture of love and gratitude to my step-father, for making this major life event possible. I could have never anticipated the distance it would travel or the impact it would have on people across the world. People I had never met were messaging me on Facebook, commenting on posts, wishing me health and happiness and congratulating me on my graduation. More importantly, complete strangers were sharing their stories of donation with me, and that to me is what it is all about. Donation is the common thread of all humanity. Every language has a word for “Yes,” and that is all it takes. Organ, eye and tissue donation touches everyone, regardless of race, culture, religion, social class, gender, and so on. I think my cap allowed donor families and friends across the world to see the impact that their loved one(s) made. Even if I did not receive a gift from their loved one, I am still connected to them through donation. The cap gave hope to recipients and those waiting, showing them that I made it to a major milestone. Transplantation does work. Donors do save and enhance lives. And “Yes,” was all it took. My donor granted me the opportunity to achieve major life events, but also minor ones as well. My donor allowed me to walk and climb the stairs to class, do my homework, take tests, and so many more things most people take for granted. Donation is the common thread of all humanity. Every language has a word for “Yes,” and that is all it takes. Lifeline: You were an honor student and a standout athlete in high school with plans to attend Sweet Briar College in 2011. But, at age 17, your life took a dramatic turn. What happened? Meredith: When I was seventeen, I was diagnosed with a very aggressive autoimmune disease that took quite a toll on my renal function. In a matter of weeks, I went from playing lacrosse to sitting in a hospital bed, receiving chemotherapy treatments just to stay alive. My life was turned upside down. I went from running sprints, to barely being able to climb the stairs. After my summer of chemo treatments, I was able to attend my senior year, play field hockey, and graduate on time. However, before I was to head off to college, I went into End Stage Renal Disease in the fall of 2011. I put on emergency in-center hemodialysis, and eventually learned to dialyze myself at home while I slept. Throughout my eleven months on dialysis, I only had a couple people tested to be living donors. On September 4, 2012, my stepfather donated one of his kidneys to save my life. He selflessly gave, the greatest gift in my opinion, the greatest gift in the world- the gift of life! He had a business, a life, children of his own to think about, but he chose to sacrifice all of that to save me. And, because of him, I was able to attend college and graduate in three and a half years. I wasn’t able to regain the life I had before, but I gained a better one. I got a second chance to do things I took for granted- I got to stand in the rain, I got to go to the grocery store, I got to clean my house. But, most importantly, I was granted a second chance to be kind to people, to be an advocate, and to love. I saw a love that only comes with donation. A love that gives life. 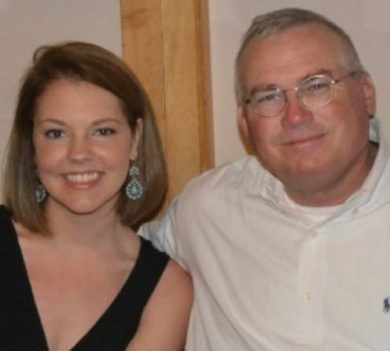 Meredith with her stepfather, Bruce. Lifeline: What went through your mind when you learned you would need a kidney transplant? Meredith: To be honest, I don’t really remember. When I first became ill, I thought a transplant was an option far in the future. After our efforts to stave off the disease failed, transplant became real. I guess then, I learned what waiting truly is. I learned what dependence truly is. I finally lost what little bit of control I had left, as I waited on someone else to save my life. Lifeline: What happened the day you learned your stepfather was a match. How did you react? How did he react? Meredith: That day is a complete blur, however I do remember the day we went into surgery. When we were walking into the hospital, I remember hanging back with him in the parking garage and saying, “ If you decided to turn back now and not do this, I wouldn’t love you any less.” And I remembered he put his hands on his hips and replied, “Can we just do this? I have to get back to work.” To Bruce, donating his kidney was no big deal; It was just another day. Our relationship was forged long before the transplant. In Bruce’s mind, giving the gift of life was such a simple, second-nature decision. It was a no brainer. I was granted a second chance to be kind to people, to be an advocate, and to love. Meredith received a kidney transplant from her stepfather in 2012. Lifeline: You had the transplant in Sept. 2012 and re-enrolled at Sweet Briar College just 4 months later. You also graduated less than 4 years later with a degree in biology. Why did you choose this track and why were you in such a hurry to graduate? Meredith: I have always had a love for life-science. I thought for the longest time that I wanted to be a veterinarian. After my transplant, I got involved with Donate Life Tennessee and Donate Life Virginia, and realized my potential for advocacy and my true calling in life. That glimpse into the field of organ, eye and tissue donation led me to my career. While I was in college, I found myself recognizing that I had more waiting on me. I had a calling to help save and enhance lives, as well as support donors and their families. Lifeline: How did you apply this biology degree? Meredith: I thought for the longest time that my disease and transplant would limit my career options, due to germs and disease. I realized that life is too short to live in fear, as cliché as that sounds. I would rather live a shorter life doing what I love and helping people, than a longer one in complacency. After completing my biology degree in three and a half years, I was fortunate enough to land a job with Tennessee Donor Services as a Public Education/Relations Coordinator. Prior to my hiring, I was able to complete two collegiate summer internship programs with DCI/TDS, which sparked my interest even further in donation. I was granted so many wonderful opportunities and made several lifelong friends with the organization. Just recently, I accepted a job with LifeNet Health as an Organ Recovery Coordinator and relocated to Richmond, Virginia. I am very grateful to LifeNet for allowing me this incredible clinical opportunity and the chance to pursue my dreams, and cannot wait to further help our mission of saving lives, restoring health, and giving hope. That glimpse into the field of organ, eye and tissue donation led me to my career. Lifeline: After graduation, you participated in the Transplant Games of America in Cleveland, Ohio. What was that like? How did you participate and why was it important for you to do it? Meredith: I wasn’t originally planning on competing in the games because I have always been hesitant to get back into sports in the interest of protecting my precious graft. When I was hired with Tennessee Donor Services, my boss told me to pack my bags, I was going to Cleveland. But in my mind, I was terrified. I hadn’t been training- I was a college student, eating Cheetos on my couch. With just a month to prepare, I started my job and the same week traveled to Cleveland. Since field hockey and horseback riding aren’t an option, I chose swimming, tennis, volleyball, and basketball. I medaled in tennis with a silver and gold, and I earned a silver in swimming as well. I remember being overwhelmed with a sense of camaraderie with the recipients, but more importantly a sense of intense gratitude to the donor families attending. 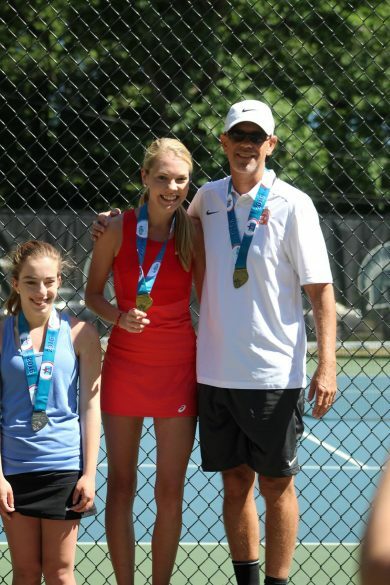 When I was presented my gold medal in tennis by a donor mom, my life changed forever. Meredith at the 2016 Transplant Games of America. Lifeline: You are embarking on yet another major milestone– marriage. You are getting hitched in a couple of months. Who is the lucky guy? How and when did you meet? Meredith: Yes! We are getting married April 22, 2017! My fiance’s name is Tanner, and we were actually a blind date in college. We were set up by mutual friends of ours, and he has made my life even better ever since. Lifeline: Why was it important for you to marry during National Donate Life Month? Meredith: Though our wedding colors are not blue and green, I feel like getting married during National Donate Life Month is just another gesture to my stepfather and every guest in the pews that has supported me in sickness and health, no pun intended, along the way. I know giving your daughter away at her wedding is never easy, but I wanted Bruce to know, that if it weren’t for him and my family and friends, I would never have met Tanner… I would never see my wedding day. My boss told me to pack my bags, I was going to Cleveland. Lifeline: You are getting married in Lynchburg, where you went to high school. Why did you choose Lynchburg? Do you and/or your fiance have family there? Are yours still in Bristol? Meredith: I remember being in high school, sitting in the pew during chapel, and thinking to myself “this is where I want to get married.” Tanner was kind enough to oblige. Virginia Episcopal School has always held a special place in my heart- If it weren’t for them, I would have never been able to graduate high school. Each and every faculty member, student, family member of the prior, helped me along my journey. My math teacher, Mr. Watson, even visited me in the hospital during my chemo treatments. It is very rare to find a school and community that goes above and beyond for students. VES loved me like family, and still feels like home. Lynchburg felt like a neutral place for our families. My family is located partly in Bristol and partly in Lynchburg, while Tanner’s is in Rockbridge County, Virginia. Meredith and Tanner will wed in April, during National Donate Life Month. 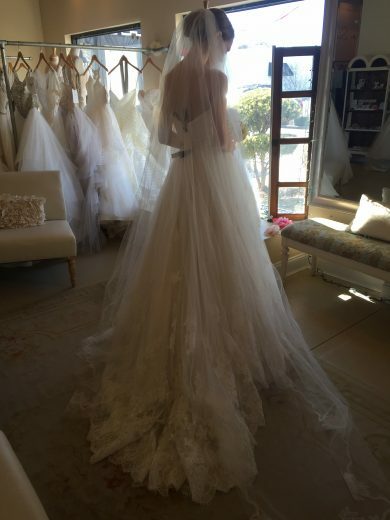 Lifeline: Speaking of wedding plans– how are things shaping up? What’s left to do? Meredith: We are less than three months away, and I am beginning to sweat. I am very behind with catering, have not chosen a baker yet, and tuxes have not been ordered! The list goes on and on but a new job has really taken my attention away from planning. I actually just ordered my invitations two days ago… oops? I am a pretty open book- I am a southern girl, and our wedding is based on the Magnolia flower. Our colors are hunter green, ivory, and gold. My new last name will be “Fox,” so that theme can be seen throughout. I wish I had more to tell you, but there is still so much left undone! Lifeline: The past 6 years have been quite a ride, what have you learned from all of this? Meredith: Throughout my journey, I would remind myself that I may not have been dealt the hand of my choosing, but I have had to play it to the best of my ability. Everyone handles challenges differently. In the case of disease, I went through four stages: I was in denial, I was angry, I began to accept it, and now I am proactive. Do I still have my bad days? You bet. This four step process is not unidirectional- but cyclical. There are days when I relapse and become angry. But I remember all the wonderful people I have met along the way and that makes my struggle worthwhile. I would not change a thing that has happened to me in the past six years, other than wishing it had happened sooner. Because of my disease, I am a kinder person. I am more grateful. I live life to the fullest. Perhaps if I had learned this sooner, I wouldn’t have burned so many bridges or I would have gleaned more from life. Meredith Haga prepares for another milestone in 2017. Lifeline: After the wedding, what’s next for you? Meredith: We actually aren’t taking a honeymoon immediately after. Neither of us have time off in our new jobs, but an anniversary trip is already in the works! As far as my future plans, Tanner and I have a six month old Golden Retriever named “Goose,” and he keeps us very busy! We hope to one day adopt a family, however Goose is the only baby we need right now. I am ecstatic about our new careers and I am thankful every day to have the opportunity to be involved with donation. 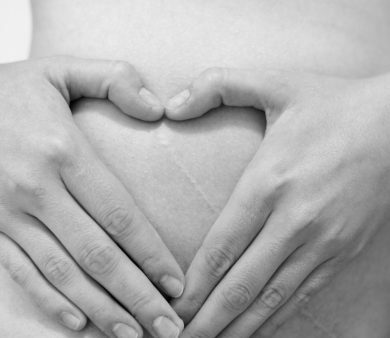 Lifeline: You are here because of a living donor. What do you wish more people understood about living donation? Meredith: You would be surprised how many people don’t realize that you can live a perfectly normal life with just one kidney. Also, kidneys aren’t the only things you can donate while living! Donate blood, donate bone marrow, donate your time. Do anything you have the power to do to help other people. Because, if it weren’t for someone that decided to help me, I wouldn’t be here. 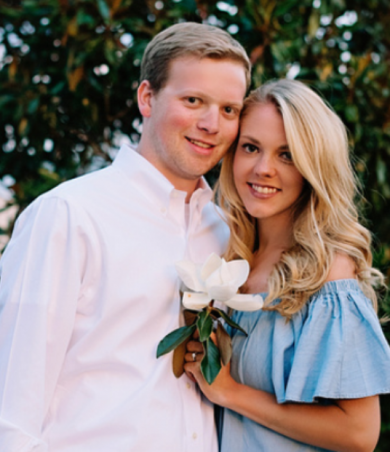 Meredith and her fiance, Tanner Fox.